Last summer, when we were on the upper deck on the boat at the Vineyard, waiting for President and Mrs. Clinton to arrive, Jackie turned to me and said: "Teddy, you go down and greet the President." "But," I said, "Maurice is already there." And Jackie answered: "Teddy, you do it. Maurice isn't running for re-election." She was always there--for all our family--in her special way. She was a blessing to us and to the nation-and a lesson to the world on how to do things right, how to be a mother, how to appreciate history, how to be courageous. No one else looked like her, spoke like her, wrote like her, or was so original in the way she did things. No one we knew ever had a better sense of self. Eight months before she married Jack, they went together to President Eisenhower's Inaugural Ball. Jackie said later that that's where they decided they liked Inaugurations. No one ever gave more meaning to the title of First Lady. The nation's capital city looks as it does because of her. She saved Lafayette Square and Pennsylvania Avenue. Jackie brought the greatest artists to the white House, and brought the Arts to the center of national attention. Today, in large part because of her inspiration and vision, the arts are an abiding part of national policy. President Kennedy took such delight in her brilliance and her spirit. 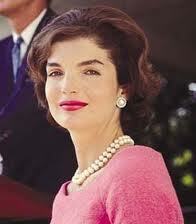 At a white House dinner, he once leaned over and told the wife of the French Ambassador, "Jackie speaks fluent French. But I only understand one out of every five words she says--and that word is DeGaulle." And then, during those four endless days in 1963, she held us together as a family and a country. In large part because of her, we could grieve and then go on, She lifted us up, and in the doubt and darkness, she gave her fellow citizens back their pride as Americans. She was then 34 years old. Afterward, as the eternal fame she lit flickered in the autumn of Arlington Cemetery, Jackie went on to do what she most wanted--to raise Caroline and John, and warm her family's life and that of all the Kennedys. Robert Kennedy sustained her, and she helped make it possible for Bobby to continue. She kept Jack's memory alive, as he carried Jack's mission on. Her two children turned out to be extraordinary, honest, unspoiled, and with a character equal to hers. And she did it in the most trying of circumstances. They are her two miracles. Her love for Caroline and John was deep and unqualified. She reveled in their accomplishments, she hurt with their sorrows, and she felt sheer joy and delight in spending time with them. At the mere mention of one of their names, Jackie's eyes would shine brighter and her smile would grow bigger. She once said that if you "bungle raising your children nothing else much matters in life." She didn't bungle. Once again, she showed how to do the most important thing of all, and do it right. When she went to work, Jackie became a respected professional in the world of publishing. And because of her, remarkable books came to life. She searched out new authors and ideas. She was interested in everything. Her love of history became a devotion to historic preservation. You knew, when Jackie joined the cause to save a building in Manhattan, the bulldozers might as well turn around and go home. She had a wonderful sense of humor--a way of focusing on someone with total attention--and a little girl delight in who they were and what they were saying. It was a gift of herself that she gave to others. And in spite of all her heartache and loss, she never faltered. I often think of what she said about Jack in December after he died: "They made him a legend, when he would have preferred to be a man.' Jackie would have preferred to be just herself, but the world insisted that she be a legend, too. She never wanted public notice, in part I think, because it brought back painful memories of an unbearable sorrow, endured in the glare of a million lights. In all the years since then, her genuineness and depth of character continued to shine through the privacy to reach people everywhere. Jackie was too young to be a widow in 1963, and too young to die now. Her grandchildren were bringing new joy to her life, a joy that illuminated her face whenever you saw them together. Whether it was taking Rose and Tatiana for an ice cream cone, or taking a walk in Central Park with little Jack as she did last Sunday, she relished being Grand Jackie and showering her grandchildren with love. At the end, she worried more about us tan herself. She let her family and friends know she was thinking of them. How cherished were those wonderful notes in her distinctive hand on her powder blue stationery! In truth, she did everything she could--and more--for each of us. She made a rare and noble contribution to the American spirit. But for us, most of all she was a magnificent wife, mother, grandmother, sister, aunt, and friend. She graced our history. And for those of us who knew and loved her--she graced our lives. Squidoo: Eulogy Samples ~ Example Eulogies, Funeral Poems, Speeches, Quotes..